The 200-mile drive across northern Wisconsin was typical even as a first-time adventure. Route 29 east and the roads from Eau Claire were easy to follow to Peshtigo. Abandoning the office and the design environment to locate and research materials for special building applications is a well-developed firm practice. It requires initial office investigations, and once a potential material or fabrication operation attracts our attention and satisfies the criteria, visits are scheduled. In late January of 2015 Evan Delli Paoli and I started a two-day journey in search of materials for three upper Midwest projects. Sentinel Structures in Peshtigo has produced exceptional laminated timber structural members for more than a century. Prior to the visit, engineers and architects we spoke to about long span wood structures suggested visiting their operations. It was not a disappointment. They shape timber beams and columns using adjustable forms dating from the beginning of the 20th century. Very few companies still use them. They were laying out laminated bents for boat hulls when we arrived. 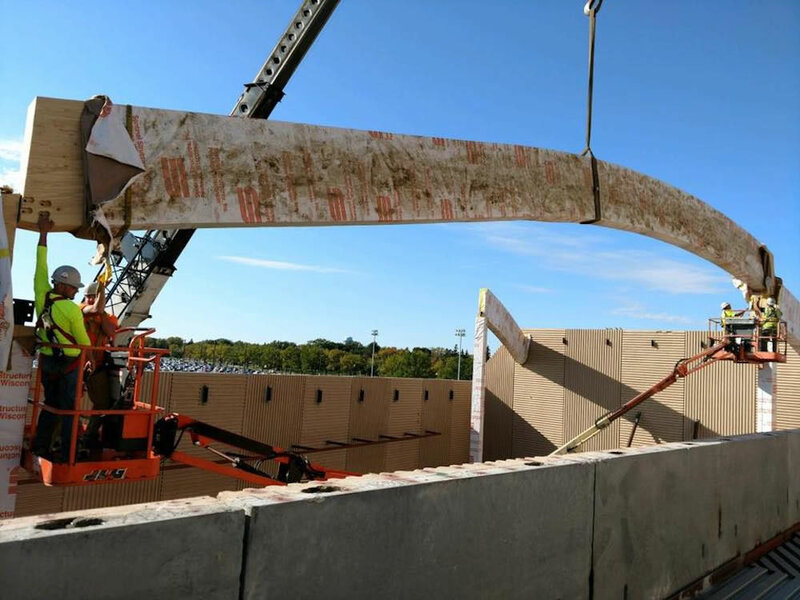 Our visit resulted in developing two curved laminated beams 90 feet long to complement other laminated beams, decking, and dormers shaping the acoustical environment of the Recital Hall at the South Dakota State University Performing Arts Center in Brookings, SD. The limiting factor for the beam design was their height, they needed to travel under highway overpasses and could not exceed the truck bed width. During the documentation process, consultation between the structural engineer, our office, and Sentinel resulted in subtle enhancements to the design and installation: separating the longest beams into three segments, ensuring column and beam widths were of similar dimensions, details to integrate connections between members sloping at dissimilar angles and ensuring that staining of adjoining wood members were different. Architects often hear from musicians – ‘wood is good’. Evan and I were searching for economic wood products and byproducts that might seldom be used in performance halls. We made three visits east of Wausau to different fabricators and distributors. Mainly oak, ash, and maple were produced in large quantities for floors. We were unaware before the journey of the impact the grading/evaluation categorizing had on the appearance of wood and the final cost of the product. Balcony fascias, railings, and acoustical reflectors for the Collins Recital Hall at the University of Wisconsin-Madison Hamel Music Center were developed from utility grade maple. Because of natural deformities—knots, branching and other imperfections—material of this grade is usually disqualified for use as a finished product. It is often discarded or used for non-architectural purposes due to these qualities. Owing to the low cost, we substituted it for gypsum wallboard that was a place holder in early project cost estimates. In the Recital Hall the irregularities add detail interest and contribute to the overall personality of the space. During a meeting at the start of construction with the millwork subcontractor refinements were made to the installation. Initially the contractor thought we had mistakenly listed utility grade for the material in the bid documents. They had priced a higher grade. After detail discussions and clarifications about the material, the rectangular wood boards were substituted instead of tongue and groove since the exposed board-ends would produce a better finished result at no additional cost. Our third visit in Mosinee with the Krukowski Stone Company was prompted in a similar fashion to the wood suppliers, by navigating the internet. All the operations had websites of interest; this was followed by telephone calls, additional detail conversations, and the shipping of small samples to our office to establish that the products met our design and budget criteria. Without the initial screening process, the visits would not have been as productive as they were. Krukowski quarries and fabricates a variety of stone types. In the showroom we met Joanie Krukowski-Whitt, her brother Jeff founded the company in 1978. Evan and I carefully examined the sample material panels on display in the showroom. The most striking was called Aqua Grantique, a hornblende/gneiss; dense, very dark, and almost black with random white veins. We were told it was most frequently used for commercial and high-end residential projects. This material was well priced and unlike granite from Wisconsin, within our budget. The quarry was the next stop, a short walk from the showroom. Although the site was icy, it allowed us to see the material in place. This was important as it provided an understanding that large blocks would be difficult to extract and fabricate. We examined cut faces at extraction points in the quarry and the overall color and veining was relatively consistent. 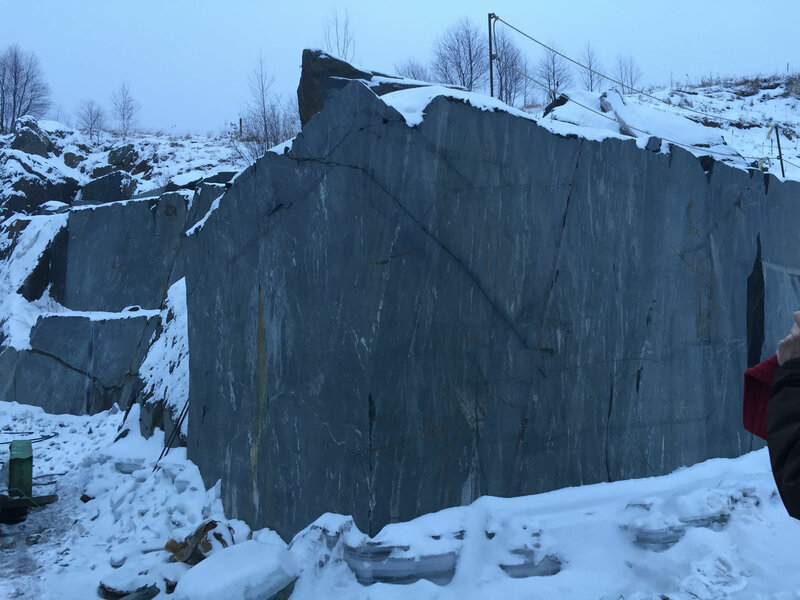 Next stop was the fabrication operation where we were introduced to Jeff Krukowski and saw hornblende sawn into slabs and then split into smaller pieces. We inspected the split surfaces to understand the dimensional variation along the length and width of any given piece. The tolerances were acceptable for a veneered cavity wall installation. We requested samples for further review at our office. 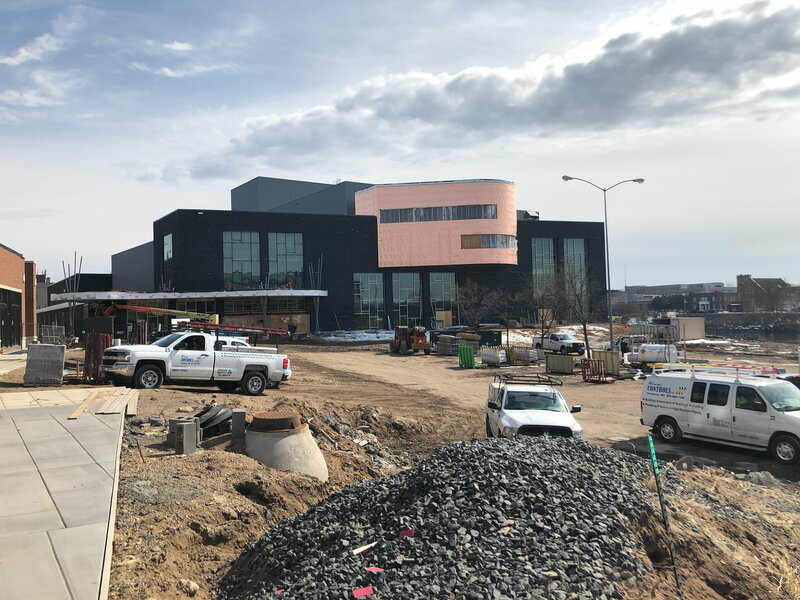 Following a thorough consideration of the stone we decided it would provide special character to the exterior facade of the Pablo Center at the Confluence in Eau Claire. This performing arts project had a modest budget and a considerable amount of the funding was being privately raised. 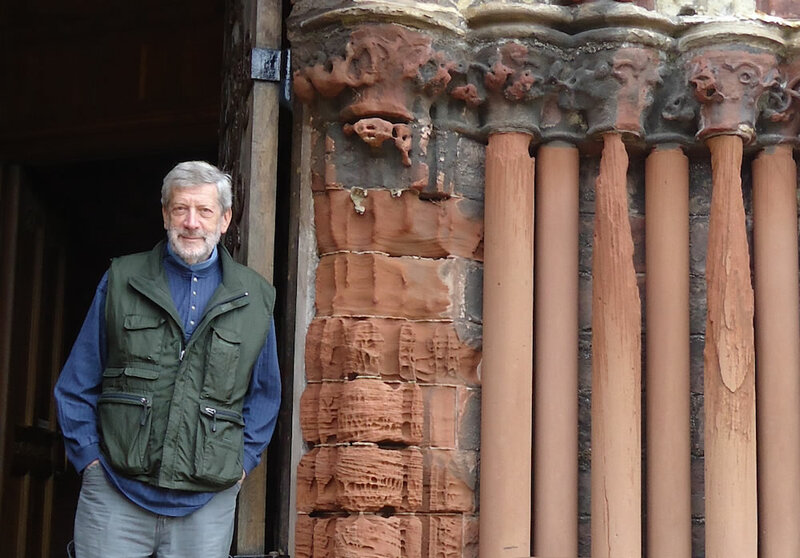 Although the material was more expensive than brick, it provided a distinct appearance. At the client workshop following the quarry and fabrication tour we presented the hornblende as a primary exterior finish. Two large sample blocks were delivered from Mosinee for the review. Considerable interest and discussion followed. Almost to a person, none of the client design committee members were familiar with the stone including the contractor even though the quarry was only 50 miles away. This presentation precipitated continuing discussions at following meetings. After considerable deliberation, the hornblende was illustrated in the construction documents and project renderings. During and just after bidding the contractor had questions: did we know how much hornblende weighed, how could a mortar joint be maintained with a split face material, and others. The height of each block was also a topic of debate. The cost estimate for the total project was satisfactory but value engineering was needed since fundraising wasn’t complete. The hornblende was an obvious target. After many months of discussion, questions persisted: could brick be used, could less expensive stone be used, could smaller pieces be used? It was decided that a member of the design/steering committee should visit the Krukowski operation. Following this tour, the stone became part of the project. Construction logic then dictated the remainder of the process. A mockup was produced by the mason to review and refine the installation, adjust intersections with other materials, and finalize mortar and caulking selections. These conditions were then incorporated into a smaller second mockup. With final resolution of all topics the second mockup became the acceptable standard for the stone installation. The dark stone and dark mortar permits the stone building surfaces to appear as large textured planes. They are the foreground character of the building. It sets off the large windows with small colored inserts in the multi-story openings, it minimizes the dark metal clad mechanical enclosures, and accentuates the copper waves—enclosing special interior spaces—that protrude from the facades. The copper will transition from a bright reflective surface, to a matte brown, and finally to a patinated green in a few decades. The stone will darken slightly over time to reveal the final personality of the project. All the participants in the process from design committee members and contractors to citizens of Eau Claire are eager to see the project completed this August and to appreciate the fit of the Pablo Center into the changing downtown identity.